Rust occurs wherever asparagus is grown and can cause early defoliation which results in yield loss in subsequent years. After spear harvest, asparagus ferns are allowed to develop. 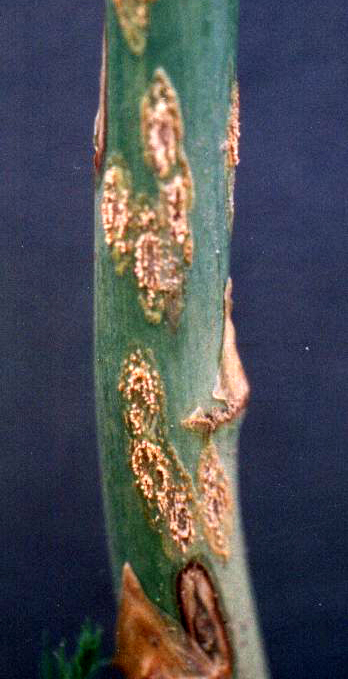 Rust infects this foliage and causes dark to brown red pustules (uredinia) on stems and needles. These lesions release rust colored spores (urediniospores) throughout the summer. Rust spreads rapidly under favorable conditions of warm days and cool nights with dew formation. At low temperatures or during dry periods, teliospores are produced in black protruding lesions and serve as overwintering inoculum for the next season. Remove infested crop residues prior to emergence of spears in spring. Destroy wild or volunteer asparagus plants. Locate new plantings away from established plantings. Clean cut fields after harvest with spears cut below soil level. Plant rows in the direction of prevailing winds to promote rapid drying of foliage. Use “slow rusting” (tolerant) cultivars such as Jersey Centennial.